For the current issue of Asos magazine I selected this month's star buy; a large briefcase-clutch in black leather and grey felt. Besides a phone and keys, it is large enough to carry what I actually need; the charger of that phone, notebooks, magazines, cosmetics case, wallet and my lunch. This was one of the outfits I wore it with and snapped for Asos, thank you Natalie for featuring me! Nice, en ben verliefd op die rok! I love the clutch - I might have to make an investment! Pure love for this look! I really like your minimal style! Love the clutch! And the skirt is pretty amazing! as if it holds so much, it looks far too small to hold all of that! I don't know if I'll ever be a die-hard fan of wedges, but I do like the curvature of the soul with the pointed up toe. Beautiful simplicity. And wow, that clutch is phenomenal. And issue with clutches can be the storage capacity, but this looks down-right brilliant. Great selection! Beautiful outfit - love your skirt - very wonderful! I'm with everything else, the skirt is gorgeous! So well made! Is it totally weird if I ask what you had for lunch? The bag is major chic. I love the two different texture of leather and felt. You are so chic it's unbelievable. I love this clutch and I love your whole look esp the skirt!! Your hair is awesome. I love the clutch. So pretty. That clutch is stunning: I want it! Love the fabric of the skirt! Follow each other? 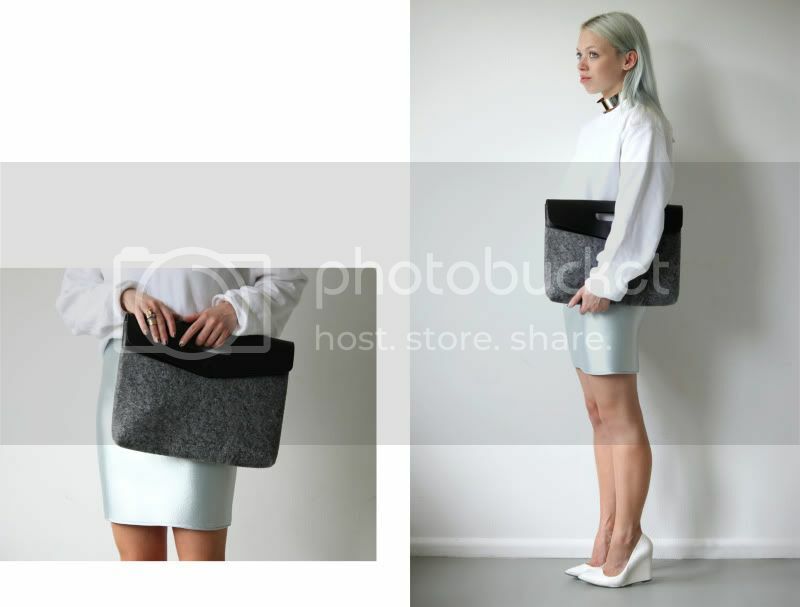 Loving your outfit, especially your felt clutch and home made skirt! Love the skirt! Tutorial please!!?? that skirt is freaking brilliant. i adore the colour. You always look fab!! I love that your hair matches the outfit!! i love this minimal look and how you make the clutch look so classy, and the seafoam skirt i must try to recreate but maybe with a front slit? what do you think? Absolutely love your self made skirt! Love the skirt! Amazing colour! please tell me more, what is that fabric? it's a dream.